Hi 125ers, please excuse my ignorance on this this topic, I've never sailed before, but lately I've developed an itch that needs scratching. I'm considering building a 125 using the stitch and glue method of construction, I've done some research on smaller sailboats that may be suitable for use on any of the small lakes located near me. My question is whether a 125 is suitable for a true beginner to learn to sail, I only intend to cruise around recreationally. Maybe another design would be more easily managed for this purpose. I'm just seeking some honest feedback before committing to this project. I think a 125 is an ideal learner's boat. There are several other types of boats also suitable but what they all have in common is that they are older designs. 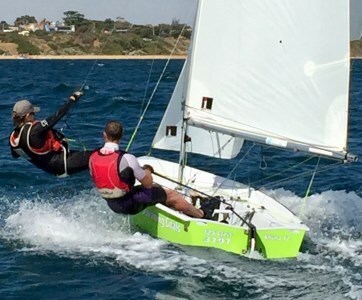 Most new designs are targeting racers as most people now buy a dinghy to race, whereas some years ago many used them for family sailing as well. The 125 is quite small so easily handled and a cinch to get on and off a trailer. They are ideal for an adult and a child but it gets squeezy with 2 kids. What I like about them is that you can quickly learn to handle the boat, and then when more confident, move on to using the trapeze and spinnaker when you have some sailing experience. However, I wonder if you are considering sailing single handed? Here I would have some hesitation as the 125 is light and maneuvers quickly and is intended for 2 people. It can be done but handling the jib and mainsail and the tiller all at the same time while changing sides when tacking requires some dexterity. This is OK when you have some experience but tricky for a beginner. One popular option is a boat with just one sail like the Laser but unfortunately you can't build that yourself. I know there is great satisfaction in building your own boat and then sailing it, but I suggest that first you consider an older boat that is no longer competitive for racing. These are often available on this site for quite low prices but might need a bit of TLC. Then you can learn to sail and see if the sailing bug bites before you go spending lots of money and time. And you will have more idea of what type of boat suits you. Remember even if you build the boat yourself, you still have to buy the sails and a trailer whereas an old boat will come with those even if they are a bit tired and worn. If you live near some yacht clubs which race dinghies preferably with a mixed fleet, I suggest you go there to see the types of boats being sailed and talk to the owners about your plans. Sailing with a club is also an excellent way to get started as there will be rescue boats about on race day to help you if you get into difficulties in those first couple of sails. Be sure to get a good PFD (personal flotation device) designed for dinghies or canoes so you have free body movement. Any dinghy can tip over at any time and the PFD will save your life - being a good swimmer is not enough. And I wish you the very best in your endeavours. Thanks for your valuable advise, I've viewed some cheap 2nd hand boats, I'm still quite set on self construction. I will be learning solo once I have completed the project, I'm wondering if I could omit the jib sail in learning or will this negatively affect the integrity of a 125? I have managed to locate a sailing club within reasonable distance from me, and of course will acquire appropriate safety equipment, pfd, gloves e.t.c. before attempting to learn how to sail. Hi Lachlan. I'm not of the opinion that the 125 is the best boat to learn in as it is a bit tender and has quite a large sail area for it's size, especially when sailing solo. A Mirror or a Pacer would be better to start in. I learned to sail in a Pacer and still managed to capsize quite often especially on a Jibe. After learning I bought an 18 foot trailable and was anticipating this to be a family activity. I soon realised the the family were not as keen on sailing as I was so I decided to get myself a small dinghy on the side which would make it easier for me to get out more often alone. This gets me back to your 125 question. Even though the 125 is not so suitable for learning is was suggested to me, by other forum members, that once I got comfortable with sailing that I would soon grow out of a Mirror or Pacer. So I decided a 125 would fit the bill. I also decided that I wanted a boat project as well, but not adventurous enough to build one from scratch, so I found myself a nice restore project. Even a simple restore job almost didn't make sense financially so I am not sure if a new build with todays materials prices is really that cost affective as there are some pretty good 125s that come along for sale on Gumtree for example, and you'll be in the water quicker. I also sail solo and even though I do sometimes use the jib, especially in very low breezes, I tend to like sailing her with just the main. I have made my own fuller from a bicycle wheel hub so when the wind picks up and I feel a bit over powered I just roll in the jib. Even though a 125 is a 2 person dinghy I don't feel any issues in sailing her solo on just the main and feel she is still a very fast responsive boat. I can only imagine what it would be like with 2 people on a spinnaker run. Which ever way you go, enjoy. Any chance you have some details on the furler system you have made? Also is it a reefing furler? I'm guessing it adds minimal weight to the overall boat. I ask as I'm thinking of doing something similar, already have a spare hub at home!